CHILLED: Drink and dine European style at Bar Remedy's pop up restaurant. A bar which has brought a touch of Paris to Leeds since opening in the last year has now launched a pop-up restaurant. Bar Remedy is the brainchild of Leeds lad Simon Hunter who wanted to bring something a little different to the area known as The Northern Quarter in addition to the barber business he has been running there for 12 years. Parisian in style and decorated with the artwork of Simon’s Polish wife, Nina, Bar Remedy is a stylish hang out - priding itself on beer, wine and cheese. Building on this success Simon has teamed up with award-winning chef James Key to bring a pop-up restaurant to its customers every Wednesday night. He said: “The pop-up restaurant has been an instant success. It’s great, simple food made with great, simple products in lovely surroundings. The menu changes weekly, depending on what products are on offer, is £15 for two courses , booking is not required and service starts at 5.30pm making it a perfect stop off when finishing work. 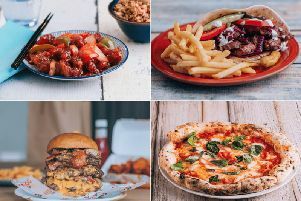 The New Briggate venture adds to the established independents in the area such as Wax, Mojo, Sela, North and Brotherhood as well as the Grand Theatre and the First Direct Arena and City Varieties Music Hall.